For the Galaxy beta, we reduced the size of the planets and the number of resources on each to make it easier to manage multiple planets. Feedback suggests that this worked, but that players would like to see some more engaging and interesting gameplay on planets. The old boring system of linking to resource deposits is dead and gone! 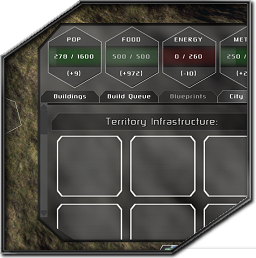 In Galaxy Beta V2.0, you’ll build roads on the planet grid out from your city to link up with deposits. Each section of road costs money and metal, and you can bomb enemy roads to disconnect key deposits from a city. We’ve also reduced the size of each city’s territory to just the six hexes surrounding the main city, so deposits inside the territory are close enough that they don’t require roads and so can’t be disrupted in this manner. The big change that comes with roads is that resource deposits will no longer be globally accessible. Many of our testers actually didn’t realise deposits were global in the beta, so we think it’ll be much more intuitive to make them link to individual cities. 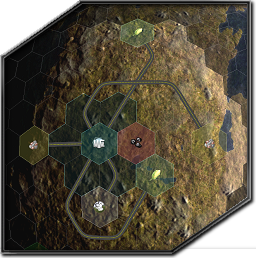 Each city now has a territory of six hexes, each of which can contain either a deposit or a road leading out to a deposit, imposing a natural limit of 6 deposits connected to each city. I think this makes a lot more sense and should be more interesting to manage. To make blueprints more useful and deposits more intuitive, we’re moving buildings like the Research Lab and Ore Refinery out of the city and onto the deposit itself instead as a piece of “Infrastructure”. Each piece of infrastructure will cost metal and money to build, consumes energy, has an upkeep cost per turn, and needs a certain number of workers to operate. Energy and workers are sourced from the city that the road leads to. Cities are now mainly residential, so blueprints work nicely and we can make cities smaller. 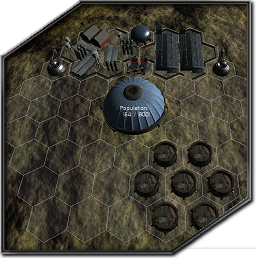 The 6-deposit-per-city limit also means that we can add more resource deposits to a planet through technologies or random events to increase the number of options available without disrupting game balance. 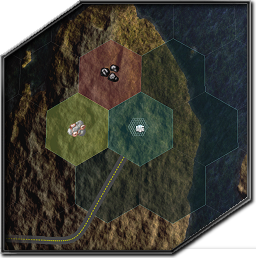 Since each hex in a city’s territory is equivalent to a single deposit, we can even let players build some deposits. For example, a Hydroponic Farm Infrastructure could be built next to your city that would act like a Farm that doesn’t need a food deposit, allowing you to properly colonise barren planets. 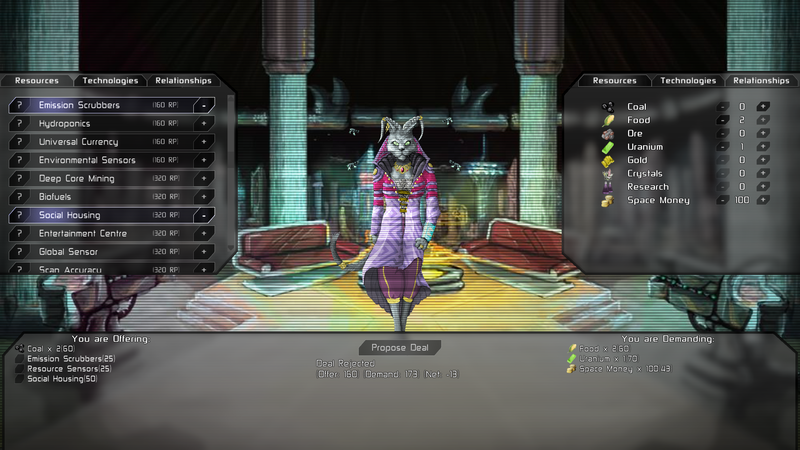 We got a lot of work done on the Diplomacy system this month, including the first generation of the diplomatic AI and most of the diplomacy screen’s user interface. You can currently add spare resource deposits, money and technologies to your offer and demand the same from the opposing race, who will decide whether to accept or decline. You can also add mutual relationship offers to your deals, like non-aggression pacts and alliances. Favour system: This will track of positive things you’ve done like good deals or gifts, and negative things such as greedy deals in your favour, wars or breaking peace treaties with other nations. AI races will remember your past actions and react accordingly. Racial variations: Certain races prefer technology over resources, and will value their preferred choices more. Counter-Offers: The AI needs to be able to make counter-offers and contact you with its own offers, so we need an algorithm to come up with those offers. Exporting deposits: We need to add a piece of infrastructure for exporting deposits from planets for trade. This will be used to send deposits to another planet in your empire, or to offer them for trade in diplomacy. We also need a system for selecting where you want the deposits you gain from trade to go. Threaten system: For those who like to play the warmongering races, you should be able to add threats to your diplomatic offers. Threaten to declare war if they don’t give you want you want, and they might take you a bit more seriously if your military is stronger than theirs. Offering ships etc: We plan to let you offer your ships and solar systems in a trade. Advisors: Some commanders you hire could also be diplomatic advisors, specialising in military, science, spying, or planetary management. They could give you hints during diplomatic negotiations, letting you know what the enemy thinks of your military strength, whether they’re in dire need of a particular resource, or if they really need a certain technology and will pay over the odds for it. As always, we’d love to hear what you have to say about the latest developments and you can head over to our forum to let us know! Tagged 4x, art, colonisation, devblog, development, diplomacy, exploration, game, game development, game-design, gameplay, gaming, graphics, indie, indie game, indie game dev, indie game development, infrastructure, kazzir, master-of-orion, may, micromanagement, moo2, planet, planets, predestination, sci-fi, screenshot, screenshots, space.